Today, Greg put up a message on the We Are Praying for Clare Mennis Facebook site, calling for Clare stories. His message is copied below. Admin will also be incorporating comments from my site. Shortly, a few of us will be putting together a memory book, for Clare’s boys – which will be bound – hence, this **final call** for comments / stories / reflections / condolences / prayers / well wishes for the family. Maybe you have some photos or other pictures or drawings for the family. It’s special for them to see their beloved Clare through the eyes of others. As you can see from the photo below, this is what passes for craft at my house. 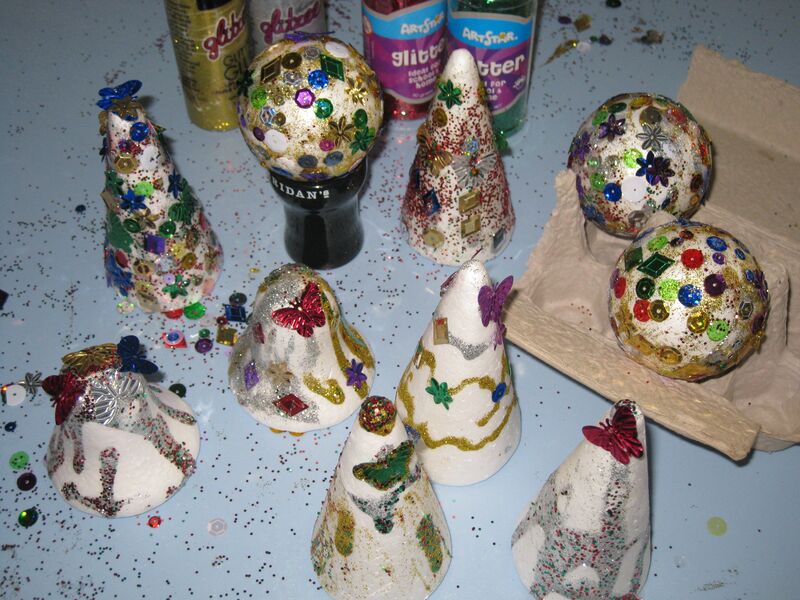 I can make Christmas trees look like cheerful Daleks (the mean robots on Dr Who). So, in all, I might not be the best person to bring onto a craft endeavour. Knowing my limitations, I’m extending an invitation to anyone who is craft-oriented, to offer their services in the making of this special book for the boys. If you have bits ‘n bobs that might lend themselves to a memory book, or have a little time or talent for such a project, I’d invite you to contact Sarah or Genevieve on the We Are Praying site, or send me your contact details through the Message box and I’ll put you in touch. a picnic set, a water cooler & tumblers, a serving dish, & additional tumblers. On top of that, Carmen Rooke (our Tupperware demonstrator and also a Mum at St D’s) put a call out to all the other Reps in her team requesting donations – & she’s had a great response…. The spirit of Mary MacKillop, who is canonised this month, is alive and well: let’s not see a need and do nothing about it. Have a safe weekend, and please, send in your reflections. You get the idea. It’s the details that will make the boys’ memory of their mother vivid. Maybe the next playgroup meeting could pass around a piece of parchment and pens, to record these little things that made Clare the person she was. Think back to your own childhood and what you remember of your mother – her slippers and apron, her cooking, the things she said when you were naughty or nice, the sounds and smells of the family home …. I’ve also had volunteers come forward to help out with making the memory book (thanks, Cathy, Anita & Rosanna) and photos (thanks, Sam). Thank you also to the readers, (many never having met Clare) who continue to offer their Prayers. I went past Pinaroo lawns the other afternoon on the bus and thought of Clare – I said a little prayer for her. Then looked up at one of the only blue patches in the sky that was over the lawns and smiled I felt a real sense of calm. A suggestion for decoration of the book could be cover the front cover in shells collected from Sandgate and her favourite colours all surrounding a beautiful pic of her or her and the family, just an idea!! I remember when I first met Clare, we were at a family bbq at Kalinga Park with a heap of other Catholic families. ( My husband, Craig had already met the Mennis’ outside the Spring Hill Clinic where he was at the prayer vigil one Saturday morning. He came home and mentioned how he had met this “awesome family from the northside” and how he would love me to meet them too.) Anyway after being introduced, I was chatting to Clare at the bbq table while the dads (Craig and Greg included) were standing at the bbq chatting over the well and truly cooked sausages while the kids and mums hung around hungry waiting for the carrying of the sausages from the bbq to the table. So we waited.. and waited.. still no sausages. In my frustration I decided to go over and get them myself, but Clare really impressed me as she patiently sat waiting, and explained she didn’t want to intrude on Greg’s conversation as she knew how much he enjoyed chatting with the other guys. Even thought she and the kids were hungry, she didn’t want him to interrupt his moment with the blokes. She really didn’t worry about it at all. She was so thoughtful of Greg and considerate of his needs. A real inspiration. Sometimes it’s the things she didn’t say that were just as impressive as the things she did say. Clare and I were chatting on the deck at the Kitts house one day shortly before the transplant. In talking about our faith she mentioned how she had loved a St Benedict Crucifix from Garabandal but it had been lost. She said how disappointed she was that she could not find it. I happened to have a St Benedict crucifix that had been given to me a few years earlier by my friend, Fr John Kennedy. It was hanging from the rear view mirror of our car parked in the driveway. This is not a common crucifix, and I usually only hang rosary beads in the car..but I felt she was meant to have it. I thought it would be something she could have with her in hospital. Then the Monday before she passed away, her original St Benedict crucifix was discovered and Clare was able to hold this in her hands until her last breath. And it was Fr John Kennedy who was with her when she died. So now her sons have both crucifixes – the original and the one from Fr John Kennedy.